Medicinal uses: An antispasmodic and aromatic plant, clary sage is used to treat digestive problems such as gas and indigestion. It is also regarded as a tonic, calming herb that helps relieve menstrual pain and premenstrual problems. 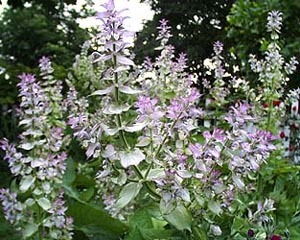 Because of its estrogen-stimulating action, clary sage is most when levels of this hormone are low. The plant can therefore be a valuable remedy for complaints associated with menopause, particularly hot flashes. Cautions: Do not use clary sage during pregnancy (Chevallier 265).